To all our Simoniz supporters in Australia we are currently having a supply problem from the UK and stocks are running out fast! What is Shampoo & Wax? "I remember the hours in the garage, the cloths and the feel of the chamois. I remember the shampoo and the fingers going cold in the water. But mostly I remember the shine." Life’s too short to spend time removing insects, tar and other deposits from your car, however unfortunately these marks can harm your paintwork as well as looking unsightly. Simoniz has decades of experience in car cleaning and caring for exteriors, and our Insect and Tar Remover makes it easy to remove harmful deposits, droppings and tar. You can use it in between washes to keep your exterior free from dirt and damage. Simply spray on and the tough cleaner will dissolve the deposits without harming your paintwork. Remove deposits easily today with Simoniz Insect & Tar Remover. No-one wants their car to smell, but spills, food and the other odours associated with daily life can build up, and are enough to make a car seem unloved or unwelcoming. Ridding your car of unpleasant aromas can instantly transform the interior and improve your driving experience. Simoniz Odour Neutraliser is an easy to use spray which removes smells to create a fresh and clean environment in your car. Odour Neutraliser can be used on interior fabrics and plastics – simply spray on to surfaces. For plastic surfaces, leave to work for 5 minutes and then wipe off. On soft surfaces, just spray on and let the Odour Neutraliser work its magic. Freshen your car’s interior today with Simoniz Odour Neutraliser. What is Carnauba Liquid Wax? At Simoniz we believe that a luxurious shine should be achievable for everyone. While some consider time spent buffing to part of the ritual of car care, we know that not everyone has the time to do this. Simoniz Carnauba Liquid Wax gives you all the shine and protection of a hard wax in an easy to apply bottle. Use after shampooing. Simply apply with one cloth and buff off easily with another – the Carnauba Liquid Wax takes little effort to use but still leaves a deep, long-lasting finish that will protect your car’s exterior. Achieve a beautiful quick shine today with Simoniz Carnauba Liquid Wax. Remove fine scratches and swirl marks easily with Simoniz Colour Restorer. If you want all the benefits of Simoniz but don’t have time to wax, then use Simoniz Quickshine Detailer Wax. Simply spray on and wipe off for a beautiful shine and instant protection. The easy to use trigger spray is perfect for topping up between waxes, or for achieving a glossy finish on the go. The added carnauba wax provides extra protection and durability to care for your paintwork, and can be used on all finishes, so you can create a showroom finish on your paintwork any time. We pour decades of experience into each bottle and have a range of valeting products to help you care for your car. Restore your car’s bodywork effortlessly between waxes with Simoniz Quickshine Detailer. Achieve a brilliant, high gloss shine with Simoniz Diamond Wax. This durable wax can be used on metallic, pearlescent and modern clear coat paintwork, and is specially developed to form a protective shield on your car’s exterior. Simoniz pour decades of experience into each bottle so that you can eliminate fine scratches and swirls for a more beautiful finish. Apply to a clean, dry car. Allow to dry to a faint haze and buff to create a high gloss shine. Get a durable glossy finish today with Simoniz Diamond Wax. Simoniz Ultracare Alloy Cleaner is a unique spray which cleans alloys quickly with no corrosive effects, even on scuffed or damaged alloys. We’ve been helping people to take care of their cars since 1910, combining an enduring dedication to quality with up to the minute knowledge of today’s motors. Ultracare Alloy Cleaner is a modern, high performance product with all the caring properties and commitment to quality you would expect from Simoniz. Unlike other cleaners, Ultracare is acid free, so even if your alloys are scuffed or damaged the cleaner won’t corrode them or cause any harm. Ultracare Alloy Cleaner has been tested against acidic cleaners – you can see the results below to show that Ultracare causes no damage or corrosion, unlike competitors. What is Back to Black Tyreshine? Back to Black Tyreshine is part of our Bumper and Tyre range, specially formulated in the lab and tested on the road to bring you long lasting gloss and shine for your whole car. It’s an easy to use aerosol which fits in easily as part of your car care routine. A clear view is crucial for safer driving, and at Simoniz we care about cars but also about the people in them. Deposits and streaks on your windscreen can reduce visibility and cause dangerous sun dazzle. Our Anti-Glare Glass Cleaner guarantees high visibility and a streak free finish so you see nothing but the road ahead. Since we started producing our Original Wax in America in 1910, we have constantly sought out new ways to help people care for their motors. We believe that cars should shine from top to bottom, and that glass should be clean, streak free and safe. We believe that this dedication to quality makes Simoniz Anti-Glare Glass Cleaner the best choice for drivers. What is Back to Black Trim Restorer? Simoniz Back to Black is a range devoted to restoring your car to a showroom finish. Back to Black Trim Restorer is a quick and simple way to clean plastics, rubber and trims, instantly returning a "new look" finish. It can be used on interiors as well as exteriors, making it easy for you to maintain the appearance of your car’s trim. Back to Back Trim Restorer doesn’t just clean – it also restores your car’s plastic and rubber and protects it against wear, producing a beautiful finish to be proud of. Bring out the beauty of your trim today with Back to Black Trim Restorer. What is Back to Black Bumpershine? If you take pride in your car and keep the paintwork clean and polished, then you want your bumpers to look their best too. Back to Black Bumper Shine is specially formulated to restore exterior plastics giving you a new look bumper. It also protects as it restores and leaves a beautiful gloss finish. Your car will gleam from top to bottom. Back to Black Bumper Shine is part of our Bumper and Tyre range, developed to make it easy for you to care for your car’s trim and tyres. Leather is a material which needs special care. Wear, scratches and dirt can cause damage, and over time will dull the appearance, so you need to keep leather nourished and protected to maintain its finish. If your car has a leather interior you’ll want to ensure you keep it in the best condition you can. To help you, Simoniz has created products specially designed to care for your car’s leather interior. Our Leather Cream can be used on all leather seats and trim to help prevent wear. Simply apply with a clean cloth, leave to work for a few minutes then buff off for an improved finish. Care for your leather interior today with Simoniz Leather Cream. At Simoniz we have a dedicated interior range which contains decades of expertise to help you valet every part of your car. The fabrics inside your car, such as on your seats and the carpet, can be difficult to clean, but our dedicated Upholstery and Carpet Cleaner makes it easy. This cleaner is specially developed for your interior fabrics and is guaranteed to remove stains quickly thanks to the helpful deep cleaning brush. It also contains a pleasing fragrance which will bring back that new car aroma. What is Complete Wheel Protector? Road dirt and grime can all cause damage to your wheels. As well as making your car look less than perfect, it can cause rust and harm the paintwork. Simoniz Complete Wheel Protector is a spray which coats your wheels in decades of experience and knowledge, creating a protective layer to prevent damage from the road and environment. It also adds that beautiful Simoniz shine, so that you can achieve a showroom finish on every part of your car. Use on clean, dry wheels as part of the Simoniz 3 Step Wheel routine. Just spray on a layer of Complete Wheel Protector and drive, knowing your wheels are taken care of. Complete Wheel Protector is part of our dedicated Wheel care range, developed in the lab and tested on the road to make it easy for you to achieve beautifully shiny wheels which are protected and cared for. What is Alloy Wheel Cleaner? Alloys and wheels need special attention. As the closest part of the car to the road they attract dirt, road grime and brake dust. Simoniz Alloy Wheel Cleaner has been developed in the lab and tested on the road for easy removal of dirt to help you achieve clean alloys quickly. It’s suitable for all alloy wheels, so you can use it with confidence, and it sprays on easily to keep your alloys clean and shiny. Alloy Wheel Cleaner is part of our dedicated wheel range, providing you with everything you need to keep your wheels looking their best. Get cleaner wheels today with Simoniz Alloy Wheel Cleaner. What is Jet Black Trim Restorer? "I remember the hours in the garage, the buffing and polishing. His secret weapon, Dad called it. That little gold tin, all the way from America, and the deep, glorious shine it left behind, protecting his car and making it more eye-catching, more expensive looking, more modern than the others on the street. I was proud of it, and that pride has never left me." 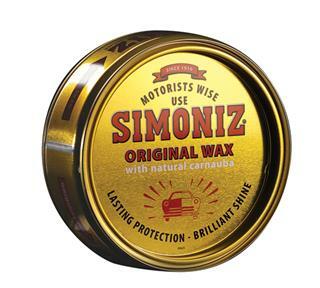 Simoniz Original Wax has been taking care of cars since 1910, and decades of experience are poured into every tin. Our original formula has been developed to handle the effects of modern driving, providing a strong protective finish which will last for several washes. We use carnauba wax in our Original Wax as it gives the best protection for your paintwork, and we believe that you deserve the best ingredients in your car wax. What is High Build Primer? At Simoniz, we want your car to look its best from top to bottom. We know that a beautifully painted exterior starts with a beautifully smooth surface. Scratches and other surface imperfections can ruin the appearance of your car’s finish and should be filled before you apply primer. Simoniz High Build Primer is easy to use and covers light scratches and imperfections, giving you a perfectly smooth base on which to paint. For best results use after sanding the area, and use Simoniz Colour Restorer Polish after painting to create a flawless finish. Get a smooth exterior today with High Build Primer. Painting straight on to plastic can be difficult, as the paint doesn’t bond with the plastic surface. Simoniz Grey Plastic Primer is the perfect pre-treatment for colour coats, to create a smooth and even base layer for you to paint on. Simoniz Grey Plastic Primer is suitable for all plastic surfaces including fibreglass and polystyrene, and the matt finish gives you a strong bond with the plastic so that your paint goes on easily and last longer. Prep your plastic surfaces today with Simoniz Grey Plastic Primer. If you’re painting a polished metal, you need a strong primer which can bond with the shiny surface and give you a base to paint on. Simoniz Etch Primer is the perfect pre-treatment for painting on polished metal as it bonds chemically with the surface to create a smooth and even base. It is easy to use and also provides excellent rust protection to stop the metal corroding, so it can be used to protect bare metal as well. Etch Primer can be used on all polished metals surfaces including alloys, welds and brazed joints so you can paint with confidence. Prime and protect your polished metals today with Simoniz Etch Primer. For a professional black finish on a range of surfaces, use Simoniz Black Spray Paint. It is specially formulated to provide a durable coating on metal, ceramic and wood. These acrylic colour coats use a superior binding system so that you only need one coat, making it easy to use at home to paint wheels, bodywork, roof racks and more. You can even use them on non car related items such as BBQs. Simoniz Standard Colour Coats are acrylic spray paints which help you to achieve a professional finish on a range of surfaces easily. These paints are durable so they can be used on cars, including wheels and bodywork, and on other surfaces which need a tough finish such as scaffolding and BBQs. Use with Simoniz primers and lacquers for professional results. Gloss white, AA Yellow, Post Office Red. What is Clear Acrylic Lacquer? If you want to enhance your paintwork with a high gloss finish, then Simoniz Clear Acrylic Lacquer can help. It’s a universal lacquer for use on any paintwork to achieve a smooth, glossy shine. The fast drying formula is easy to use so that you can transform you car’s exterior at home, creating a durable finish with shine that will last. Simoniz Clear Acrylic Lacquer is part of our paint and maintenance range, developed to help you with the bigger jobs at home. It can be used to refinish almost anything, from bodywork and engines to BBQs and scaffolding. Achieve a high gloss finish today with Simoniz Clear Acrylic Lacquer. No primer required – easy to apply in one coat. Spills and marks are inevitable in a car when you’re on the go, but they can leave your car’s interior looking and smelling unpleasant. It can be difficult to clean soft fabrics like car seats, so having a cleaning product to hand to deal with spills as they happen can keep your car looking at its best. 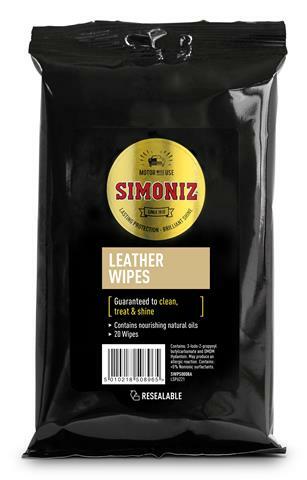 Part of our dedicated interior range developed to keep your car clean, Simoniz Upholstery Wipes have a foaming action formulated to remove tough stains quickly. Keep them in your car and use them any time to freshen your interior and restore to a lovely new car fragrance. Each pack contains 20 easy to use wipes. 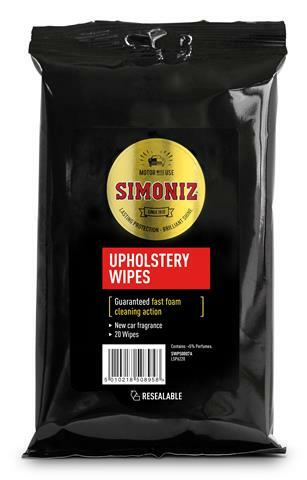 Remove stains and marks from your car’s upholstery any time, with Simoniz Upholstery Wipes. Safety is a priority when you’re driving, and dirt, marks and smears on your car windows can be distracting and dangerous. Simoniz Glass Wipes help you get a clear view of the road any time. They can be used on windows and mirrors to remove dirt, giving you higher visibility and helping you focus on your surroundings. These Glass Wipes are designed to clean quickly and efficiently, leaving a smear-free finish. They can be kept in your car for convenient cleaning any time. 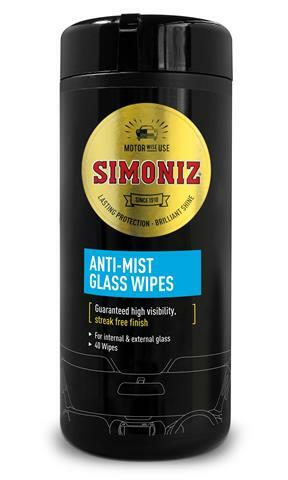 Keep your car’s windows and mirrors clean and smear free with Simoniz Glass Wipes. We sell and recommend a huge range of Simoniz products. Use the link below to scroll through the range of Simoniz products. 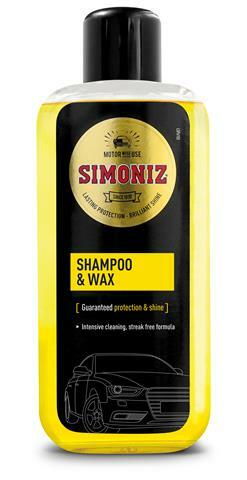 CLICK ME TO ORDER SIMONIZ ON-LINE!